It can be difficult to uncover the roots of the sudden appearance of spots on crop foliage. Turnip bacterial leaf spot is one of the easier diseases to diagnose, as it doesn’t really mimic any of the more prevalent fungal diseases. Turnips with bacterial leaf spot will diminish plant health but will not usually kill it. There are several preventative techniques and treatments if spots on turnip foliage turn up. Bacterial leaf spot of turnip begins to appear on the upper sides of leaves. It isn’t very evident at initially, but by the time the disease progresses it is fairly easy to spot. When left unchecked, bacterial leaf spot on turnips will defoliate the plant and reduce its vigor, which can also diminish turnip production. The first signs will be on the upper surface of the leaves, usually at the edges. These will appear as pinpoint sized black holes and irregular circles with yellowish haloes around the veins. Water-soaked brown spots develop on the underside of the leaf. The tiny spots bind together into larger olive green lesions that become papery and still have the characteristic haloes. The centers of the irregular spots may fall out. The easiest way to discern if this is a fungal or bacterial issue is to examine the spots with a magnifying glass. If no fruiting bodies are observed, the problem is likely bacterial. 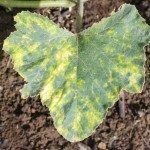 What Causes Turnip Bacterial Leaf Spot? The culprit for bacterial leaf spot is Xanthomonas campestris and is harbored in seeds. It is important to try to source disease free seeds to prevent spreading this bacterial disease, which will then live in soil for a short time. The bacteria can infect many types of crops and even ornamental plants. It also lives a short time on contaminated field equipment, plant material and in soil. The equipment and water splash spread the bacterium throughout a field quickly. Warm, wet conditions encourage the spread of the disease. You can prevent turnips with bacterial leaf spot by limiting the amount of time the foliage is wet. This can be done by drip irrigation or watering early enough in the day that the sun will dry the foliage. Bacterial leaf spot on turnips has no listed spray or treatment. It can be minimized with good sanitation practices, crop rotation and minimizing wild host crucifers in the area where the turnips are planted. Copper and sulfur-based sprays may have some beneficial effects. A mixture of baking soda, a tiny bit of vegetable oil and dish soap, combined with a gallon (4.5 L.) of water is an organic spray to combat not only bacterial issues, but fungal one too along with some insect problems.